INTERNATIONAL SEMINAR AT ALLIMAND: 15 NATIONALITIES REPRESENTED! 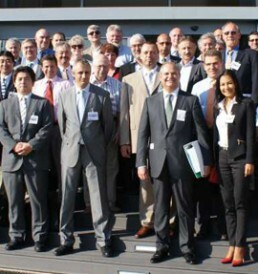 The 4 – 5 & 6 July, ALLIMAND, Designer and manufacturer of paper machines and paper industry equipment, organised at the headquarters in RIVES, the « ALLIMAND Agents Days » with all their agents. This was an opportunity to review the company’s results and strategic projects for the next few years. « This international seminar is an excellent way to bring everyone together and both reinforce our privileged relations with all our ALLIMAND agents from around the world and inform them of our strategic evolutions » explained Franck RETTMEYER, Chairman & CEO. The following countries were represented: Germany, Australia, Austria, China, Korea, USA, Indonesia, Japan, Morocco, Poland, Czech Republic, Russia, Slovakia, Tunisia and Turkey. The first two days were packed with strategic and technological information followed by a visit of the workshops. « Our International Agents were impressed by the high technological level that ALLIMAND has reached over these last three years » adds Fabrice GILET, Sales Manager. The numerous questions that followed the conferences given by ALLIMAND’s sales and technical managers showed the strong interest the agents have on the subjects broached. These three days reflected the conviviality and excellent spirit generally felt by the group with the combination of hi-tech technology, heritage and cultural richness.